From a cabinet of intimate memories to two moons and a lot of clouds in a photo booth, the works that deserve a look at the India Art Fair. The previous night, she spoke about the little village in the mountains in Korea where she stayed for a week learning how to make the traditional hanji dolls. Shormii Chowdhury, a Baroda-based artist, took a train to a deserted station with a paper where she had noted the essentials in Korean like potato, bread, etc. For the rest, language was not needed. On some nights, the rains made her feel like it would sweep her away. In Jeonju Hanok Village where she had gone to learn the art of making paper dolls, Chowdhury also stumbled upon stories of resistance and abandonment. In an old wooden cabinet, there are miniature paper dresses hanging in hangers. On top of the cabinet, a little doll is crouching by herself. And underneath the cabinet, there is a pair of wooden slippers. The cabinet is a shrine of memories of self and the others. Perhaps of a childhood that was spent in an old house in Kolkata in the company of women. She calls it 'The Second Skin'. 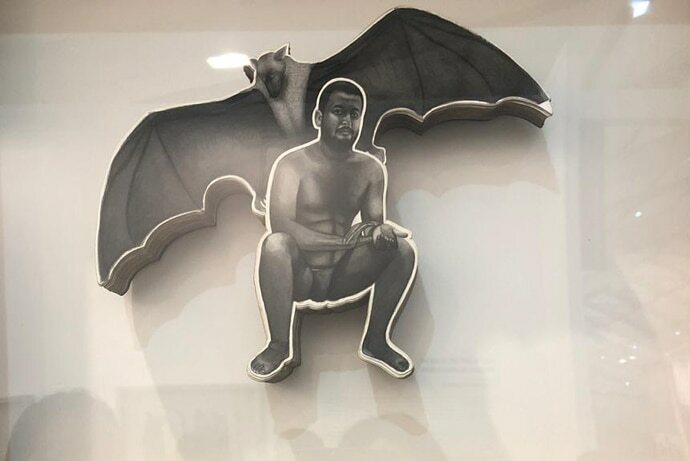 At the latest edition of the India Art Fair in the national capital, Chowdhury’s work conjures personal histories and invokes memories that have been contained in a cabinet. The little doll is perhaps her. Among the stalwarts of the art world whose canvases cover entire walls, her cabinet is like a little shrine on a busy street. And it is upon the restless to enter its intimate enclosure. 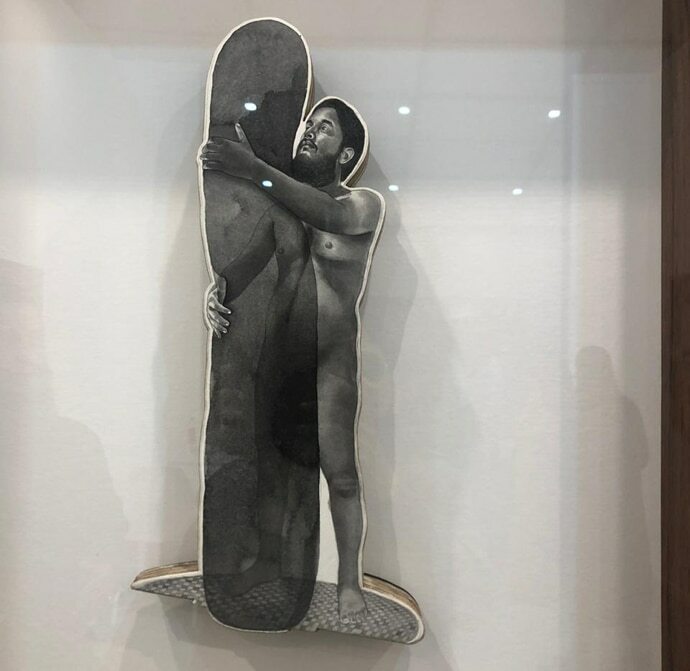 If art’s purpose is to move the viewer and let them experience a memory, a loss or a fleeting or lingering sadness over absences, Chowdhury’s cabinet fulfills its promise. You are almost confronting a place of fragile faith. You want to touch the dresses, to console the doll, to take the cabinet home and make it an altar of memories. In another space, in a frame, a man is embracing his shadow, which looms over him. It is the impossibility of holding on to what he calls ego that he wants to portray on canvases where he has pasted hundreds of layers of paper on top of each other, says Prajjwal Choudhury. “Shadow is not a shadow but an ego. You can’t hold because it doesn’t exist. Shadow is just an image,” he says. His autobiographical series, 'The Sleep of Reason Produces Monsters' is a take on Goya’s etching. But there is also an encounter with fantasy. There are images of himself and his wife who act as protagonists. He talks about the first frame where a man and a woman are taking a bath from hoses and the water runs over their bodies. “We are struggling for a child for the last four years... we have taken an inauspicious bath every month. Our expectation is not fulfilled,” the Baroda-based artist says. The frames displayed at the Gallery Latitude 28 booth contain his fears and his dreams. In another frame, a man is crouching on a carpet. “Carpet is about fear. I always feel I am going to die and I am always holding my hand and checking my pulse,” he says. There is him holding a stone. He says it is patience stone of the Persian belief. “It absorbs pain,” he says. There is despair and there is a resignation about a prolonged present made heavy by impossibilities. “The loss of a loved one, the inability to conceive a child: these are incidents beyond figuration. In this situation, the layering of paper serves as a formal device to gesture towards trauma as a relentless accretion and repetition of the surface. But trauma is conventionally understood as a past that continually breaks into the present,” says Choudhury who seems to offer us something slightly different: a present that never recedes into the past, that never opens into the future,” says the concept note called 'The Visible and the Invisible' by Mila Sandub. 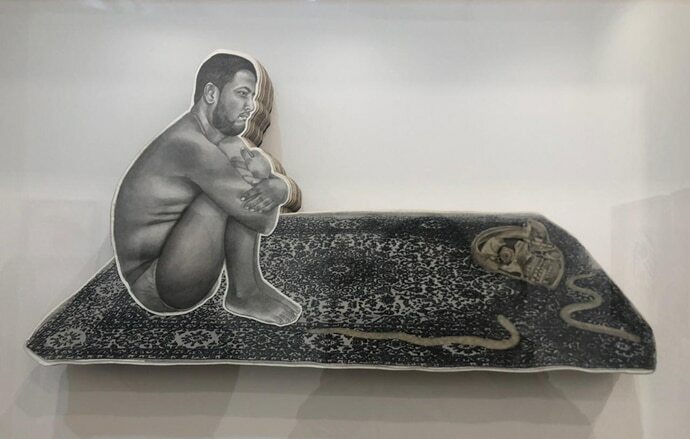 Towards the end, there is a self-portrait where Choudhury, naked, is seated in front of a fragmented jalee, takes his own pulse. “Why are we living and what does it mean to live like this,” he says. Standing in front of these frames means confronting an elongated present full of magic realism and despair, of butterflies and lizards and carpets and graves and of two people struggling with hope and reality. 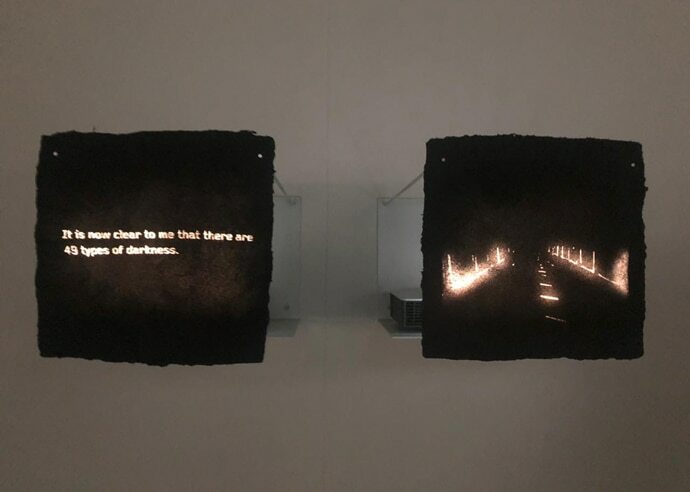 One of the most prominent works at the IAF – Choudhury’s brave portrayal of the personal trauma as a way to experience the stillness of time – is yet another work that deserves to be seen. 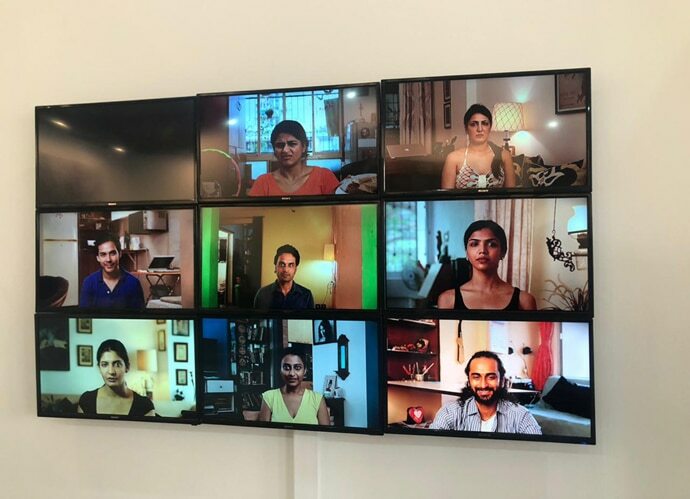 And while there is an invocation of despair and the hope of redemption in shrines of intimacy, there is also an invocation of a happy time of melas in the photo booth installation by set designer and artist Aradhana Seth. Called 'Fair-Un-Fair', the project curated by FICA has a studio set up of old times where families and individuals posed against fantastical backdrops that were often of dream destinations and painted in bright colours. 'The Merchant of Images' is a way of combining the world of film with art and it was in 2015 that she went around Vancouver with a photo cart inviting people to get their pictures taken against the backdrop of the Taj Mahal. 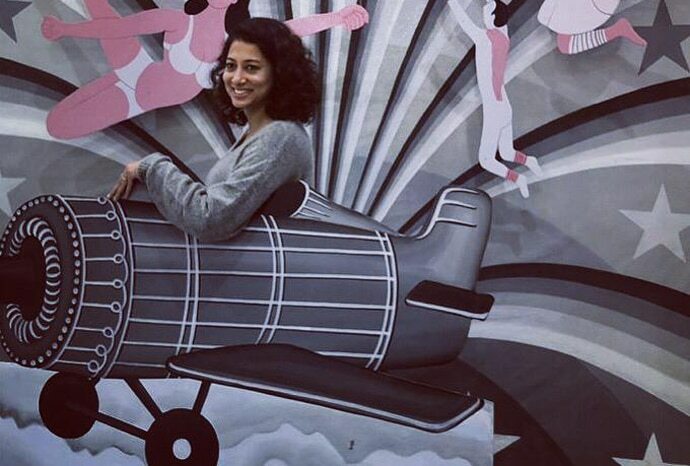 At the IAF, there is a plane in a pink and grey sky, there are pink combs and mirrors and even a guitar cutout you could use as a prop. On the other side is a sky with stars and crescent moons. Yes, two moons. One you can hold as you become the skywalker and walk on the clouds. She invites you to get your picture taken. In this setting, it is a space that is almost believable because we witnessed it in the past. And you want stars in a city where the haze is permanent. And if the stars aren’t shining in the sky, they can always be painted on canvas and you can always reach for them. This is that space. A happy place. A place frozen in time where you went to studios, you had albums and you didn’t doubt the set created for the picture. For me, it was my neighbourhood studio with its fantasia setting and a little flower vase with unnatural roses perched on a gilded half-pillar. I still have it in the album where my mother’s pictures are preserved. Her holding a pitcher and posing against a backdrop of hills and rivers. And in Seth’s photo booth, I happily posed with the two moons as I sat in the clouds. Among the other favourites is an untitled video projection of the nine rasas by Sudarshan Shetty, who offers no text, no explanation. At the Gallery Ske booth, there is a video of nine people shot in their homes who are emoting one of the nine rasas in loop. As a viewer, you are confronted with the emotions of the people who are looking at you. You see love, hate, disgust, indifference and anger. You feel the gaze and you feel alive in a world of projections. Unnerving at first, in a classic Shetty style, the projection is about existence and its poetic expression pitched against the reality of death. It is perhaps a reminder for an experiential living. Lastly, there is a film and installation by Amar Kanwar called 'Such a Morning at the Cellar' in Okhla about a mathematics professor who chooses to become a recluse and starts living in an abandoned train coach away from everyone else. Here, according to a theory presented by the filmmaker, the man is preparing for darkness. He covers the windows of the coach and lies down in darkness. The film continues on the walls, where as part of the installation there are poetic texts of letters and images that continue the narrative. A rusted old coach lies outside the building in Delhi as an ode to the quest of darkness by a man who said there are 49 shades of darkness. Part of the Kiran Nadar Museum of Art, the project is a space of questions and curiosities. There are 49 shades of darkness, he says. And maybe there is the 100th one that you can claim but to get there, you must walk in a tunnel with the blindfold. Because all shades of darkness call out to you. You must not pay heed to it because black holes are pits of eternal damnation like the train coach the old master chose as a place to accept and reconcile with the darkness. You want to ask the artist how he dealt with all the darkness. And you wait for a better time till you have read all the letters on the walls. The cabinet of intimacy, the frames of despair and stillness of present, the photo booth of two moons and the nine people enacting emotions and the professor in the film who chooses darkness are all metaphors for personal and political and creates an 'Almanac of the Dark'. 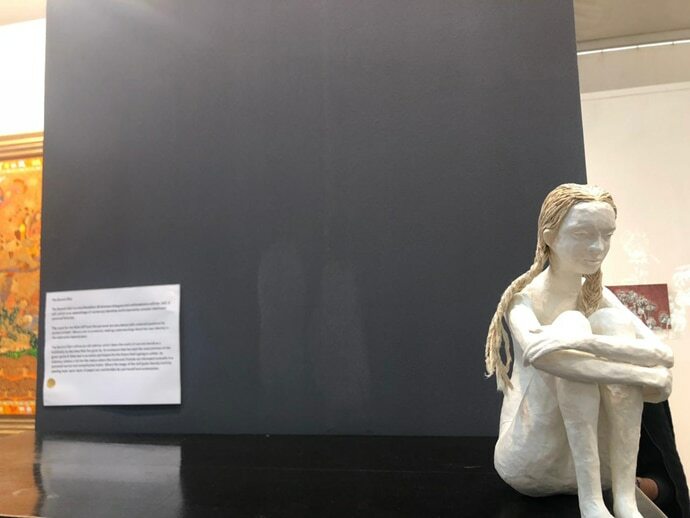 For Chowdhury, the doll is the girl she was, the cabinet a collection of absences and a showcase of a woman’s own exploration of the self in the world without and within. I wanted to bring the doll home and keep her with me and maybe take her to the photo booth and hand her the crescent moon so she can smile again.